A review of Simon Warren’s Cycling Climbs of Yorkshire. 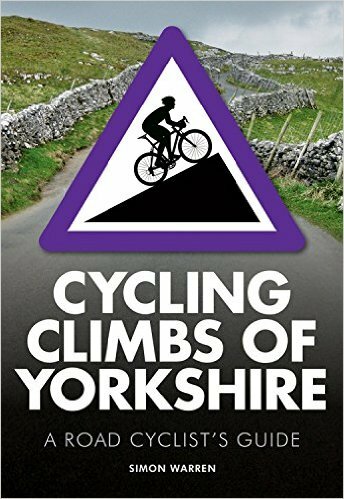 The book features 75 climbs from all corners of Yorkshire from the East Riding to the Yorkshire Dales and south Yorkshire climbs. 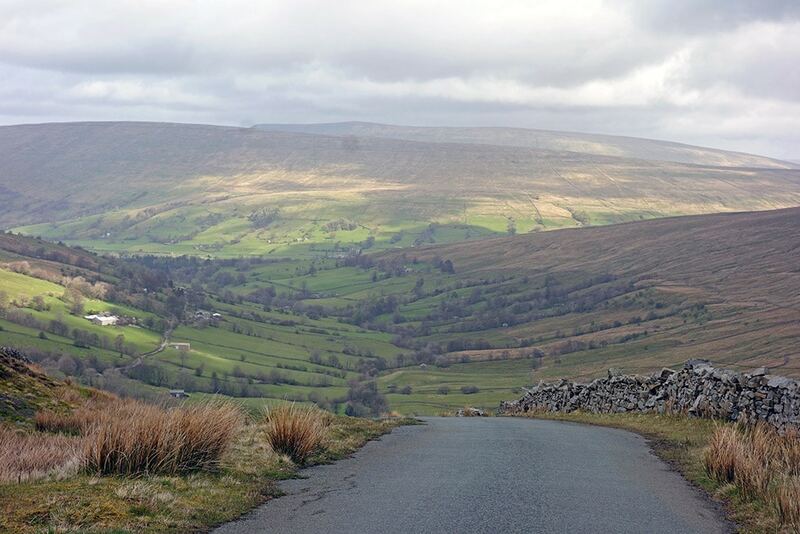 I was brought up in Yorkshire, learning to cycle amidst the dales and hills. 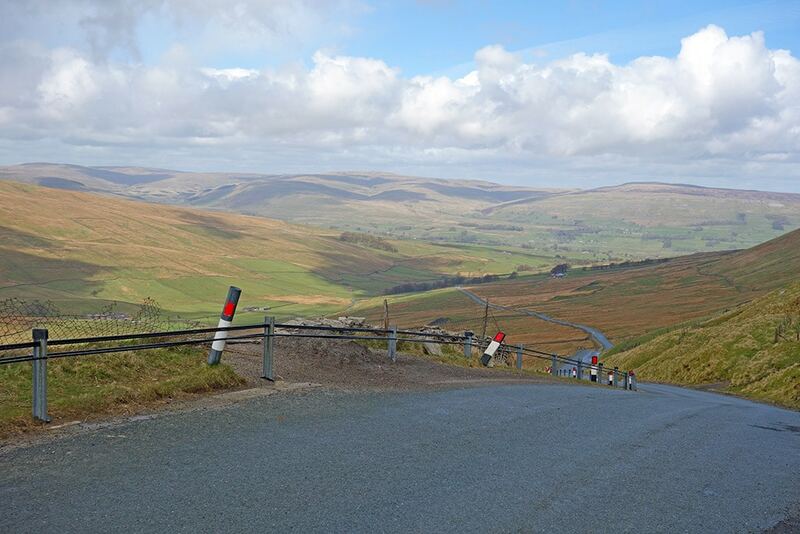 Climbs like Park Rash and Fleet Moss were enough to create a little fear and trepidation in the average club cyclist. It was only on rare summer days, we would go ‘over the top’ to Hawes and leave the comfort of the lower Wharfedale slopes. These days I’m fortunate to often go back to Yorkshire and I often end up searching some new hill climb challenge. There is a great variety in Yorkshire, from the big hills of the Yorkshire Dales, to the ridiculously steep 30% gradients of the North York Moors and also the short cobbled climbs of Halifax and Calderdale. It was only in recent years, I started to learn the joy of climbs around West and south Yorkshire – built up areas, but still some great hills and good for cycling. The 75 climbs offer a broad overview of the Yorkshire climbs. Of course, you could easily find another 25 or 50 climbs to add to this selection, but it is still a lot to be getting on with. I have done a fair proportion of the hills in the book, apart from in the very far north and very far east. I doubt I will be travelling to Hull to do some of the smaller climbs featured in the first part of the book, but I will be visiting Todmorden, where three really hard climbs have been picked out. As the saying goes, you can throw a dart at a map and come across a good climb in this part of the world, but having a list of climbs helps motivate to go the extra mile to find new terrain. 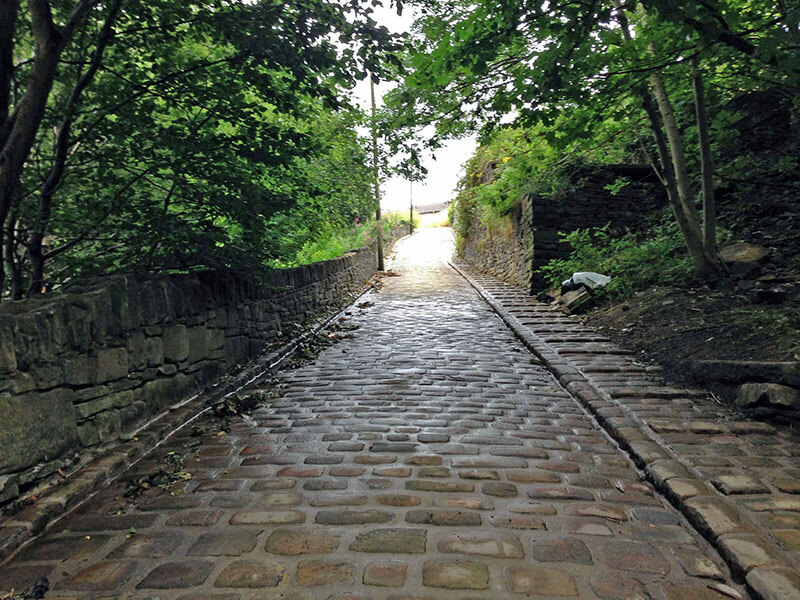 For me, perhaps the most notable omission is perhaps the Buttress in Hebden Bridge a short 25% cobbled climbs, which reduced me to walking. It is still a motivation to try and go back and climb the one hill I have been defeated on. Though the Buttress is a little on the sadistic side, really you need a mountain bike to get up. So maybe people will be glad it’s not in. Which is the best area in the country for hills? A slight detour from a review of the book. But, in my biased opinion Yorkshire is the area which has the greatest diversity of good hills in the UK. True, the Lake District comes close with perhaps the hardest climbs like Hardknott and Wrynose Pass. Scotland has the longest climbs, and if I ever visit Scotland with my bike I may change my mind. I haven’t had chance to do Wales or Cornwall justice either. But in my view it will always be hard to beat Yorkshire because the hills are really good, and the scenery is epic too. Last week I was racing in Hampshire. When I travel down to these sleepy ‘home county’ villages, I think this so quintessentially England. When I go to Yorkshire, I just think this is so quintessentially Yorkshire, and Yorkshire is one of best places to cycle – as long as you like the hills. But, I will avoid a speech about Yorkshire Independence and YEXIT and get back to the book. Pea Roy Lane – mixed emotions about this climb. 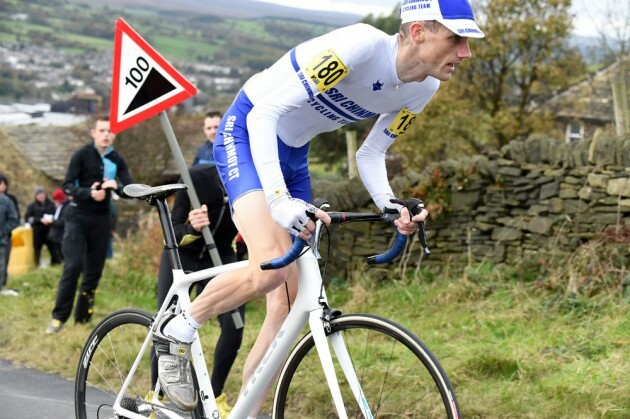 The other thing about Yorkshire Climbs – quite a few have featured in hill climb races, giving an added emotional significance. The Stang, Norwood Edge, Guise Edge, Pea Royd Lane, Cragg Vale e.t.c. all conjure up different memories of hill climb events. A deserted road near Malham and Arncliffe. Another example, the climb from Stainforth to Halton Gill is a great challenge, but the road is wonderfully deserted with just the looming presence of Pen Y Gent on your right hand side. I hope I’m not being too pedantic but on the road from Stainforth to Halton Gill, Pen Y Gent is the magnificent lump on your left. On your right is Fountains Fell, famous for its boggy summit feared by Pennine Way walkers. Thanks for your blog Tejvan, always a good read, especially the Yorkshire bits. 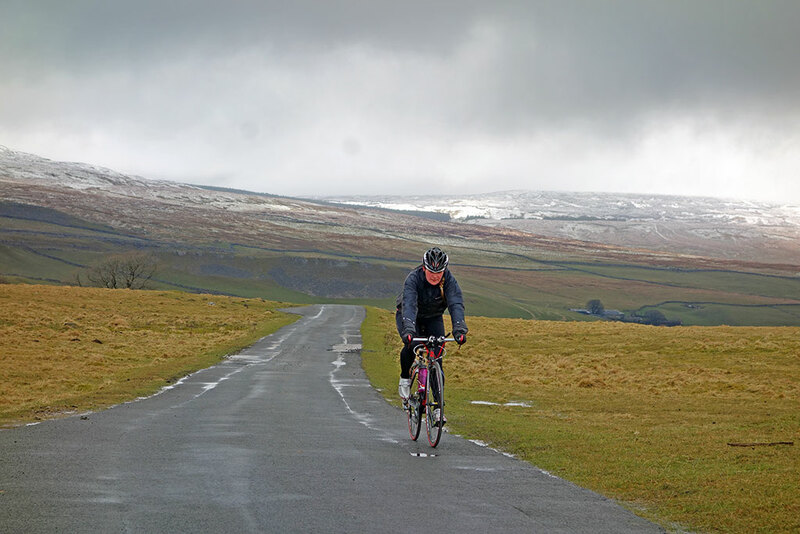 You have a great blog and I enjoyed the Yorkshire Hill Climbs piece. You might be surprised by some of the climbs in the Yorkshire Wolds, they may be short, but some are steep (20%+) and like a wise man once said “If you can’t cycle up a steep gradient, it doesn’t matter if it’s 100m or 100 miles”. I don’t think that the book has what I’d consider to be the toughest climbs in the Wolds, in fact it has two which are relatively easy (Brantingham & Nunburnholme). The harder climbs are all around the north wolds, on the border with North Yorkshire and around Thixendale. My personal favourites are Thrussendale, Greets Hill, Worsendale and Flixton…ouch! I think I may have to purchase this book, great insightful review! The overlap from other books should be fine for me as I haven’t purchased any of them. Re. Ruddlestone climb is on Dartmoor, not Exmoor.